There comes a time when humanity is called to shift to a new level of consciousness, to reach a higher moral ground. A time, when we have to shed our fear and give hope to each other. That time is now. 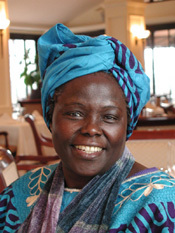 Wangari Maathai is a name very well-known in the world of development activism. She was the first African woman to receive the Nobel Peace Prize in 2004 for her contribution to sustainable development, democracy and peace. She always stood for the poor, marginalized and the politically disenfranchised. It was indeed coincidental that she passed away on Sept 25th, just one day after I landed in Kenya. It is indeed ironical that the Government which had imprisoned her several times and tried to silence her criticism of their policies, has ordered a state funeral. It is the first time that a state funeral will be held for a civilian in that country. One needs to understand the context and conditions in which Prof Maathai came up. At a time when girl children were seen as domestic help and not even sent to a school, she battled all odds and forged ahead in her academic life. After a degree from the University of Kenya, she did her Masters from the United States and returned to her home country. She was known for her environmental activism and started the Green Belt movement. But for her, large portions of the forests of Kenya that she loved and cherished would have become real estate for greedy politicians. No wonder they hated her guts and refused to accord her any sort of official recognition. What attracted me to her was her multi-dimensional approach to human development. She was one of the first who articulated that mere environmental activism would be of no avail in a country that accorded such a low status for women. She was a very vocal and articulate feminist and combined feminism, gender issues, environmental concerns and democracy into a comprehensive demand of development for the millions of indigenous people of Kenya. She also tried her hand in electoral politics and was a member of the Kenyan Parliament for a short time and also served as a deputy minister for environment. Structured Government work and the politics that go with it did not permit her to continue in this assignment and she soon resigned. Subsequently, the then male dominated political setup in Kenya ensured that she lost all elections she contested, including that of the office of the President. Prof Maathai was a very respected and acclaimed person worldwide and the world of activism will miss one of its leading lights. Her work will now be carried forward by the hundreds of men and women that she inspired all over the world. Previous Article Information is indeed power!